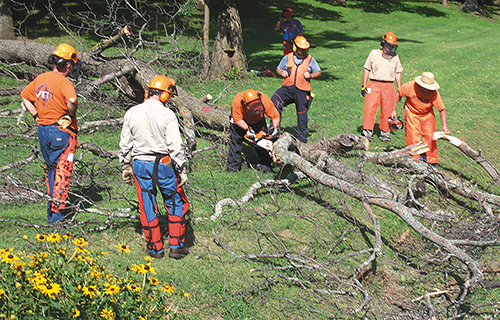 Participants practice chainsaw safety skills. They are Richard Norman, Ed Bevers, Kent Carbaugh, Mike Sheehan, trainer Joe Glenn, Curtis Cromwell, and Scott Stone. Some disaster response volunteers were puzzled. Did they really need three days to learn about chainsaw safety? In the “Storm Damage CleanUp Course,” six Oklahoma volunteers came to value that time commitment. From six districts, the volunteers traveled in July to Mount Sequoyah Conference Center, a UM facility in Fayetteville, Ark. They gave their time, money, and talents to learn skills that will further enable Oklahoma United Methodists to safely, effectively serve victims of disasters. Chainsaws are vitally useful and necessary tools in many disaster response situations. They are among the most dangerous hand tools. After the training, Michael Sheehan commented, “The chainsaw course is the needed, appropriate length, although I did have my doubts before we came. Richard is on the right path with his ideas of not getting the cart before the horse in disaster response.” Sheehan is from Boston Avenue United Methodist Church, Tulsa. Norman said education, leadership, and training are his top priorities at this time for effective and viable disaster response ministry. He urged interested people to contact him about participating in this type of ministry: 800-231-4166 ext. 2032, RNorman@okumc.org.